It’s a tower of power here at ARTfarm this morning. Luca harvested over 150 heads of lettuce early this morning (In addition to vast piles of fresh herbs, greens and root vegetables) and they are rapidly being converted into delicious salad mix for you! 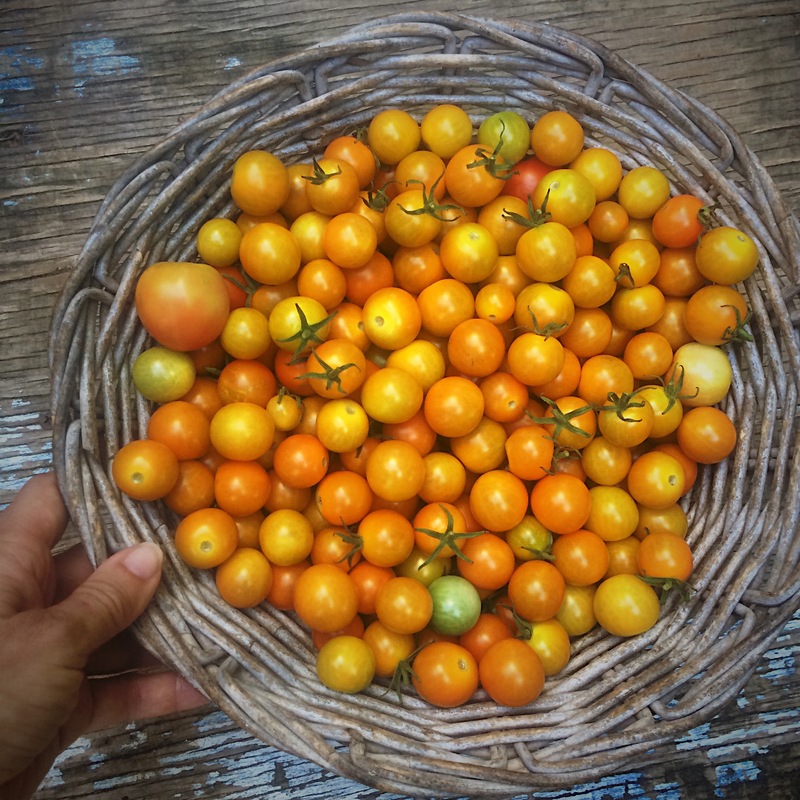 In addition to our sweet salad mix, baby and teen spicy salad mixes, baby and teen arugula, microgreens, and heads of Romaine lettuce, we have early bird CHERRY TOMATOES!! We also have fresh cucumbers, sweet potato greens, beets, radishes, the three basils, mint, dill, recao, garlic chives, bananas, and fresh picked zinnia flowers. From our partners we have I-Sha’s vegan coconut-and-fruit ice creams, and avocadoes and sugar apples from Aberra Bulbulla. We are open 3–6 p.m. this afternoon, so head down to the South Shore and power up with healthy veggies!! Endless Learning at ARTfarm – open Saturday! The school year is upon us: a time to come out of our summer relaxation mode. At ARTfarm we are taking a little time off from food production to work on projects around the farm, including upgrading our bee boxes and getting a little more serious about our beekeeping efforts. Christina is delving into her beekeeping books and resources and stumbled across a real gem to share with anyone who is on a learning curve or is heading back to school with new challenges ahead of them. “The most important thing you can learn in life is how to learn… Most people don’t know how to learn. Here are some rules about learning that I don’t think most people know. “Rule one: if you’re not making mistakes you’re not learning anything. “Making mistakes and learning are inseparable. If you’re not making mistakes you’re not pushing the limits of what you know, and if you’re not pushing those limits, you’re not learning. Make mistakes and learn from them. I’m not saying you can’t learn from other people’s mistakes or from books, but in the end you have to make your own mistakes. “Rule two: if you’re not confused, you’re not learning anything. “Confusion is the feeling you get when you are trying to figure things out. If you think back to the last card game you learned, you were told the rules, which you couldn’t remember, but you started playing anyway. The first few hands were terrible, but then you started to understand the rules. But that was only the beginning. Then you played until you started to understand how to play strategically, but until you got good at it you were still confused. Gradually the whole picture of the rules and strategies and how they fit together started to congeal in your mind and then it made sense. 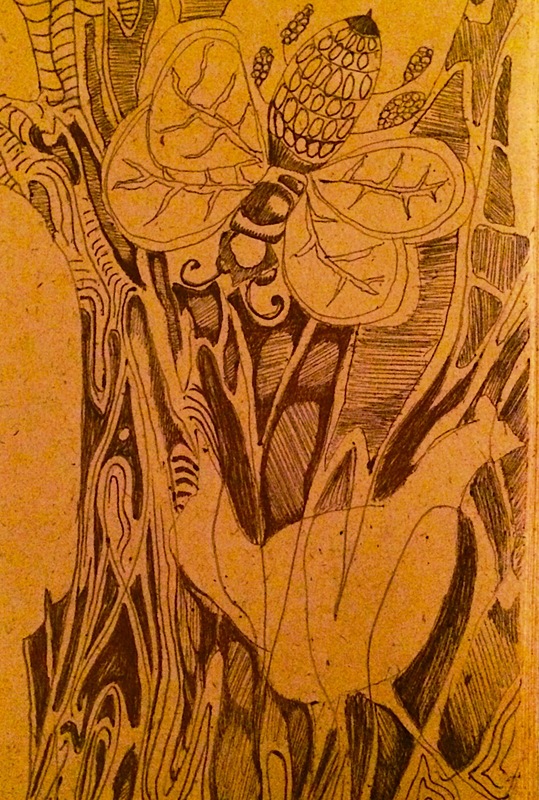 The only way from here to there, though, is that period of confusion. “The problem with learning and our world view is, we think things can be laid out linearly. You learn this fact, add this one and that one and then finally you know all the facts. But reality is not a set of linear facts; it is a set of relationships. It is those relationships and principles that understanding is made up of. It takes a lot of confusion to finally sort out all the relationships. There is no starting and ending point, because it is not a line, it is circles within circles. So you start somewhere and continue until you have the basic relationships. “Rule three: real learning is not facts, it is relationships. “It’s kind of like a jigsaw puzzle. You start somewhere, even though it doesn’t look like anything yet. Everything you learn in any subject is part of the whole puzzle and is related to everything else somehow. It is much more important to have a few facts and understand the relationships, than lots of facts and no relationships. One little part of the puzzle put together is better than more pieces and none of them put together. Knowledge and understanding are not at all related. Don’t go for knowledge; go for understanding, and knowledge takes care of itself. “Rule four: it’s not so important what you know as it is that you know how to find out. “Tom Brown Jr. wrote a survival guide. I read survival guides all the time, but they usually frustrate me because they give recipes. Take this and that and do this with it and you have a shelter. The problem is, in real life you usually don’t have one of the ingredients. Tom Brown, though, in his chapter on shelter, showed how he learned how to build a shelter. Telling you how to build a shelter and telling you how to learn to build a shelter are as different as night and day. What you want to learn in life is not what the answers are, but how to find the answers. If you know that you can adjust to the materials and situations available. 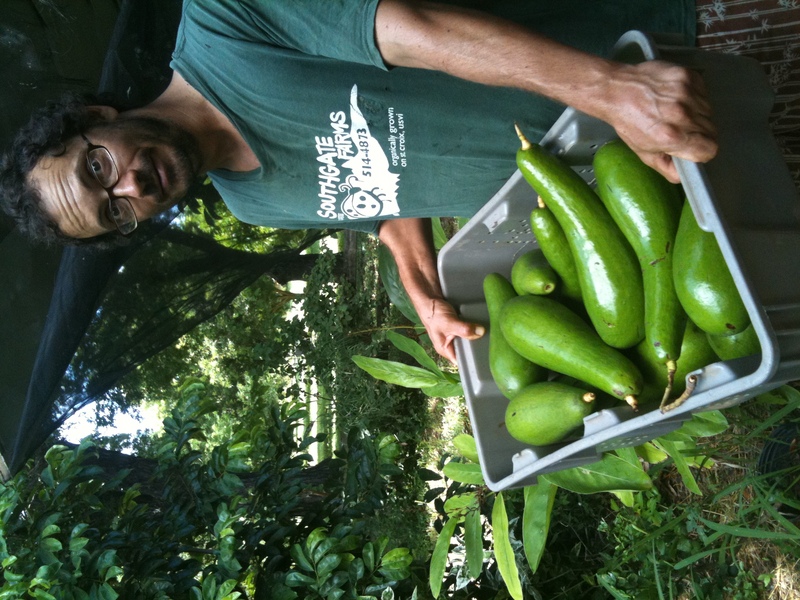 For Saturday, 10 AM – 12 noon, rain or shine: Sweet salad mix, teen spicy salad mix, teen arugula, cucumbers, onions with green tops, sweet potato greens, bunched arugula, garlic chives, basil, holy basil, Italian basil, lemongrass, recao, mint, papayas, bananas, passionfruit, and sweet soursop. From our partners: mangoes and avocados from Tita and Diego, Haitian kidney mangoes from Dennis Nash, a few dragonfruit from Solitude Farm, and artisanal breads from Tess. Flood watches are in effect, so please drive carefully and err on the side of caution when passing through puddles. Succulent ARTfarm Summer Saturday – 10am – 12 noon! 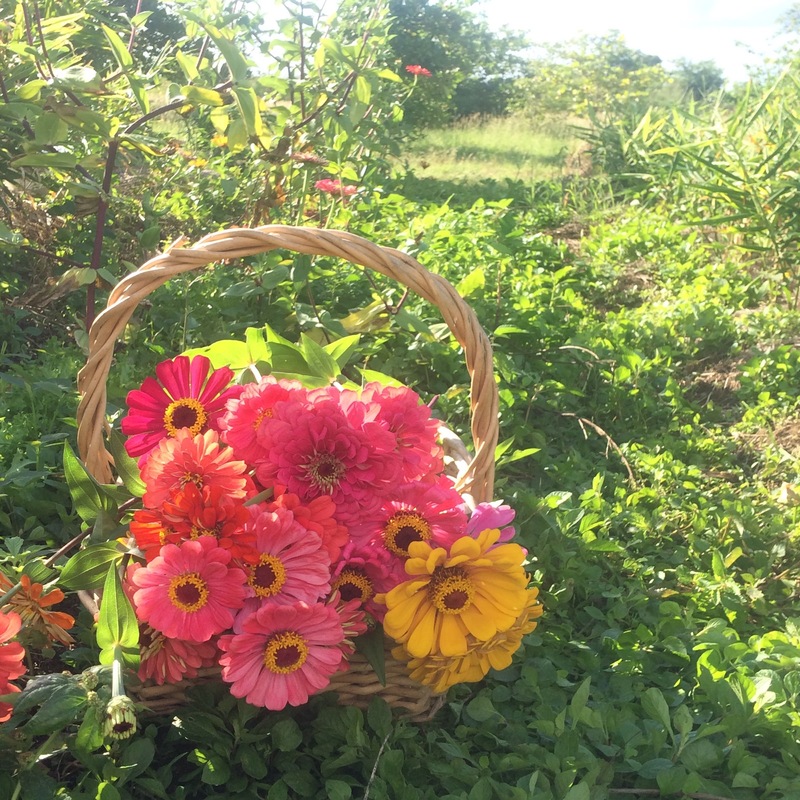 Summer continues to roll on with more treats coming ripe from various fruit trees across the island. Last Saturday we enjoyed some avocados from Diego (grandson) and Tita (abuela). 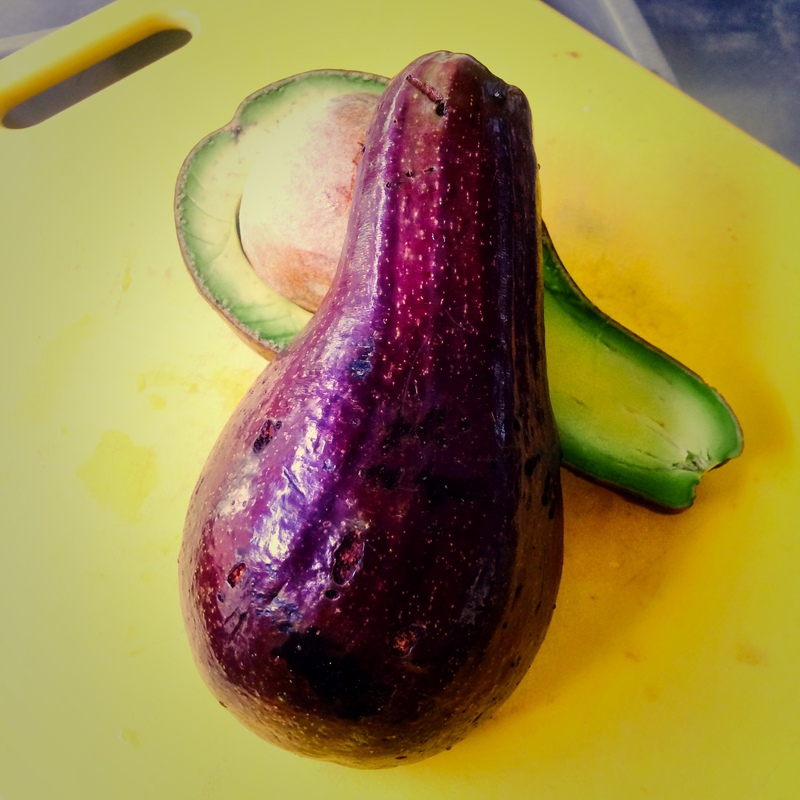 What we DIDN’T KNOW about those avocados is that they turn a brilliant (and, if unexpected, slightly alarming) shade of purplish red at the moment they are ripe and ready to eat. Ours was ready on Thursday. We have more of those avocados this week, and some of them are at the ripe stage. They are a local seedling variety, so we welcome your creative ideas on what to name them. How about “mood ring avocados”? ARTfarm fields produced this week: Sweet salad mix, microgreens, baby arugula, teen arugula, teen spicy salad mix, freshly harvested beets with green tops, sweet crispy cucumbers, freshly harvested onions, sweet potato greens, cooking greens, radishes, Italian basil, Thai basil, holy basil, lemon basil, lemongrass, thyme, recao, mint, big sweet soursop fruits. From our partner farmers and friends: mamey sapote from Tropical Exotics, more magic-color-change avocados and big ‘threadless’ mangoes from Diego & Tita, Haitian kidney mangoes from Dennis Nash, a few dragonfruit from Solitude Farm, coconut based vegan local fruit ice cream from I-Sha, and fresh baked breads from Tess! Open today and every Monday, 3-6pm! Figs again today, kids! FIGS! Fresh, Mediterranean figs! Creamy avocados grown here at ARTfarm! Crunchy cucumbers today in various varieties! Sweet onions grown in healthy, chemical-free soil! And the usual gang of winter choices: Sweet salad mix, spicy mix, lettuce heads, heirloom tomatoes, cherry tomatoes, slicing tomatoes, escarole, endive, dandelion greens, Bodhi yard-long purple beans, Italian basil, lemon basil, recao, cilantro, sage, garlic chives, fresh cut zinnia flowers… local honey, and Feel-I’s vegan coconut based local fruit ice creams! Can there be too many exclamation points! Really! I think I have just about reached the limit here! It’s like sitting on a cactus, now! Come out and see us this afternoon! 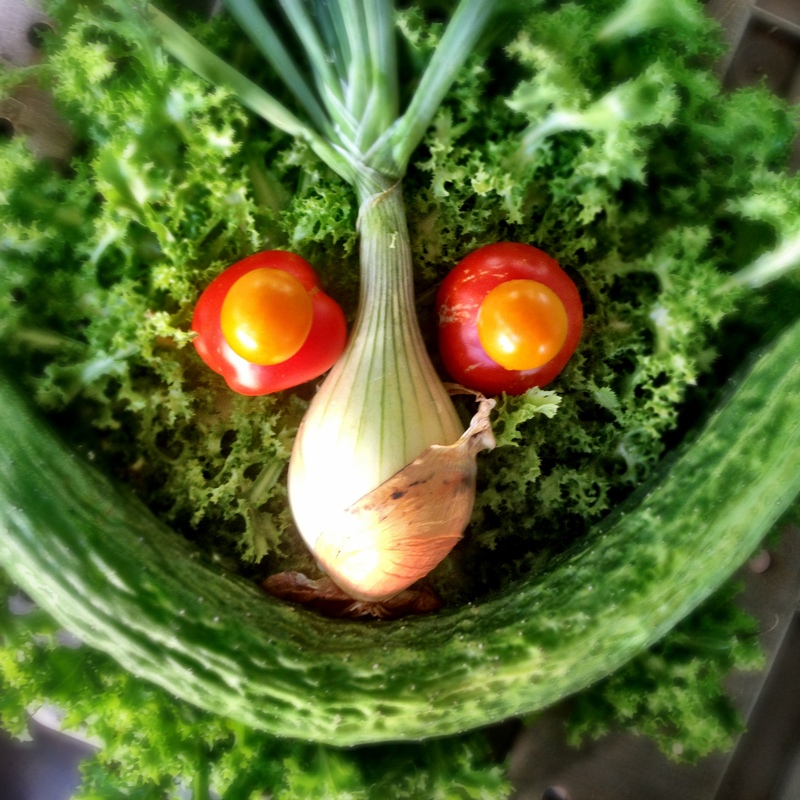 ARTfarm produce can really make you smile! Freshly harvested endive, tomatoes, onions, cucumbers and more! Get down to the South Shore for some goodness! 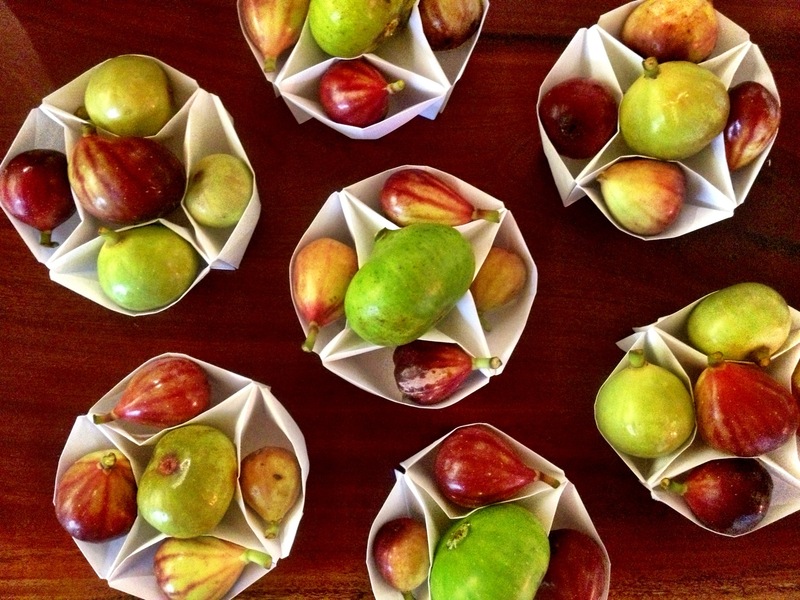 FRESH FIGS Saturday ARTfarm! 10am-12noon! FIIIIIIIIIIGS!!! FIGS FIGS FIGS!! We are not talking about bananas. We are talking about Ficus carica, Mediterranean figs, tender, sweet and juicy, pearshaped and pink as a kitten’s nose inside, harvested by starlight! In at least five varieties for you to develop your fig preferences! Good morning! Fresh figs! FRESH FIGS! In giftable little origami baskets! ARTfarm now has fresh figs for sale! Origami paper baskets hold five assorted variety luscious fresh figs each, in brilliant jewel-like shades of green and red, and various sizes and shapes. Also – microgreens, arugula, sweet mix, spicy mix, lettuce heads, dandelion greens, escarole, endive, sweet bell peppers, cherry tomatoes, large heirloom tomatoes, slicing tomatoes, cucumbers, Bodhi beans, radishes, beets, onions, a few avocados, Thai, Italian and lemon basils, dill, cilantro, recao, garlic chives, sage, thyme, lemongrass, chili peppers, lemon balm, holy basil, zinnia flowers. Nature’s Answer to the Juicebox at ARTfarm, 10am-noon Today! We have amazingly sweet coconuts you drink right out of the nut! If you haven’t had fresh coconut juice right out of the husk, you haven’t tried what man has attempted to recreate in plastic pseudo-nutrition with Gatorade and juice boxes. Fresh coconut juice is locally known as a kidney cleanser. It’s full of trace minerals and potassium. In wartime when plasma was not available, fresh coconut water was used in IV drips to hydrate patients in hospital. We can cut your coconuts at the farmstand for you to drink immediately, or almost open – take a few home and stick them in the fridge. We keep a whole pitcher full of coconut water in our fridge. There is nothing better for rehydration. For your veggie pleasure we have fresh harvested arugula, baby spicy mix, microgreens, asian spinach, garlic chives, basil, lemongrass, mangoes, avocados, Feel I’s ice cream and Sweetface chocolate! For your yard we have native trees! See you at the farmstand! Holy Guacamole – ARTfarmstand this morning! Whoa! Farmer Luca looks on in amazement at the giant Russell avocados! 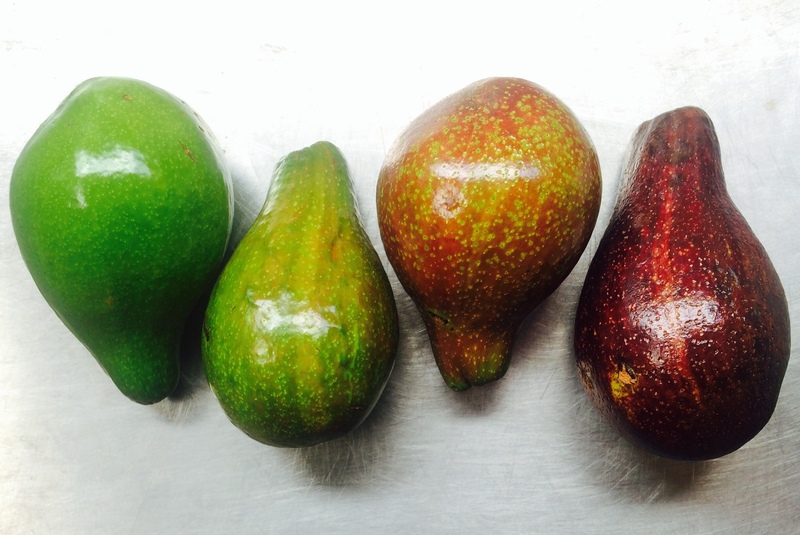 If you love giant avocados, you’ll enjoy today’s farmstand. We also have baby spicy salad mix, microgreens, arugula, asian water spinach, garlic chives, basil, thai basil, lemongrass, and two out of season renegade cucumbers who just cropped up on their own this summer. In the fruit department we have for you today: local bananas, malay apple (aka wax jambu, Caribbean apple, pomerac), mesple (aka brown sugar fruit), mangoes and strawberry guava! If you’ve been very very good, we have freshly made Sweetface chocolates, and Feel I’s icecreams in local fruit flavors. And we have beautiful native trees for sale. We love you. Come see us on this fine glittery Saturday morning, 10am to noon!